Design Society has opened its doors in Shenzhen, only one hour from Macau. You can visit its galleries, shops and theatre. You can enjoy the roof garden, and experience design. But whatever the individual visitor’s destination, the promise of Design Society is to provide a platform for many to explore scenarios for design in China. More than a lecture, this can be a brainstorming session for future input from Macau. Ole Bouman, former Creative Director of the Urbanism/Architecture Bi-City Biennale Shenzhen (2013–14), is now the Director of Design Society, Shenzhen. He was the founder and editor-in-chief of architecture magazine Volume. His publications include The Invisible in Architecture (1994) and Architecture of Consequence (2009). From 2006–2013, Bouman was the director of the Netherlands Architecture Institute (NAi). He was co-curator of Manifesta 3 (2000), and has been responsible for many contributions to architecture biennales in Shenzhen, São Paulo, and Venice. 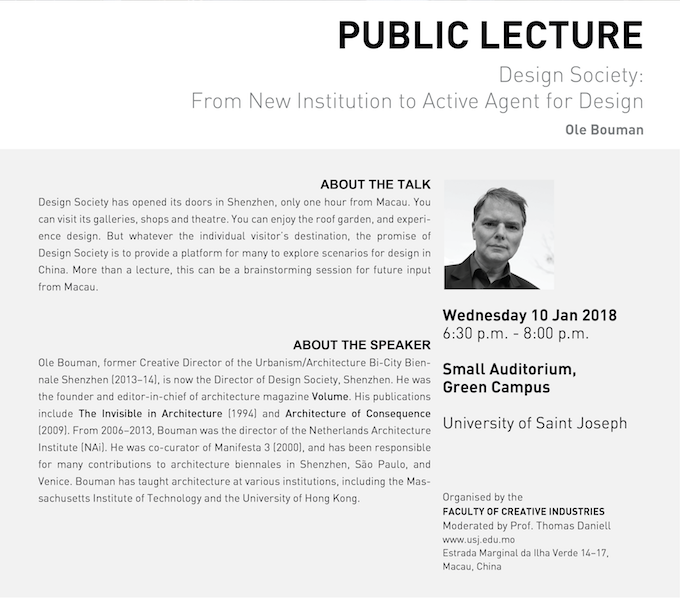 Bouman has taught architecture at various institutions, including the Massachusetts Institute of Technology and the University of Hong Kong.